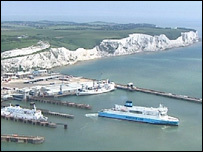 Professional Tour Guide, Canterbury, Leeds Castle, White Cliffs of Dover, see Historic Greenwich. Optional for inside visits. Admission fees not included but may be purchased from your guide. Tuesday, Wednesday, Thursday, Friday, Saturday. 0190E Child rate from 3 years old. Senior over 65 years old. Departing towards the South of England, you travel through the County of Kent also known as "The Garden of England", the trip takes you along the route of popular and religious tradition: "The Pilgrim Way". Immortalized by Geoffrey Chaucer in the 14th. 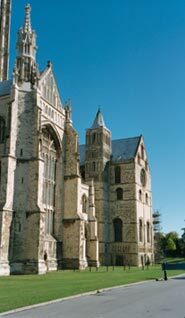 C. in his most famous book "Canterbury Tales", the city is the cradle of Christianity in Britain. Just before arrival, the first glimpse of the Cathedral does impress with its majestic beauty, but nothing prepares you for the intricate medieval stonework of this " Flower of the Perpendicular Style". It became a place of pilgrimage in 1170 when St Thomas a Becket was murdered inside his own Cathedral. Stop at Leeds Castle, one of the prettiest in England. Surrounded by a moat and in the middle of an enormous park, the castle contains a large collection of medieval furniture, tapestries and old paintings. The castle includes a large variety of facilities from the licence to marry, to an elegant Tea Room, Aviary, idyllic gardens, wooded hills and it is heaven for children for its maze, nature trails and small jeep wagons. Admission fees are not included but may be purchased from your tour guide. Passing Greenwich where the Meridian line was invented, admire from the distance Greenwich Park where the National Maritime museum and the Royal Observatory were built in 1675 by Sir Christopher Wren. Finally, the tour concludes in Central London at approximately 18.30 after a full day discovering the treasures of Kent and enjoying a full and adventurous day full of new things to see. Courtesy morning pick up from most London hotels will be confirmed by email after your reservation. Please note that children must be accompanied by an adult. Senior: Age 65 years and over.